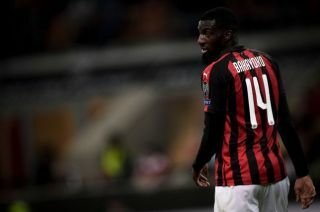 Chelsea loanee Tiemoue Bakayoko has had an incredible turnaround at AC Milan, as he is undoubtedly now a fundamental figure in Gennaro Gattuso’s side. The 24-year-old has made 27 appearances so far this season, grabbing the opportunity to establish himself in the starting line-up with both hands after Lucas Biglia picked up an injury. With the Argentine stalwart returning to the squad this past weekend to face Cagliari, he was forced to remain on the bench with Bakayoko being selected to continue in the deep-lying midfield role. After a disastrous start to life in Italy as he was heavily criticised by the Italian media for his poor initial performances, the Frenchman has undoubtedly turned things around as he consistently proves to be one of Milan’s most important players. The Italian giants are chasing qualification for the Champions League this season, with their win over Cagliari on Sunday night moving them back into fourth place. Bakayoko will undoubtedly be crucial to their hopes of finishing in the top four, and as seen in the video below, he has won over the Milan fans as they’ve even now got a chant for him. It translates in English to: “Bakayoko, Bakayoko, fight for the Curva, and for the Diavolo, Bakayoko, Bakayoko”. As noted by Calciomercato, Bakayoko is currently on a season-long loan deal from Chelsea, with Milan holding a reported €35.5m option to buy clause to make it a permanent move. Based on his influence in the side currently and his growing popularity, it would surely be a shock if they didn’t exercise that option.